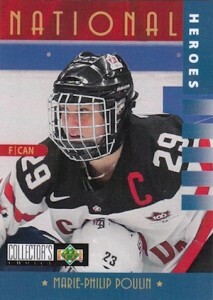 Hockey Canada has a storied history on the international scene. In the last 25 years, that has been especially apparent at the junior level. 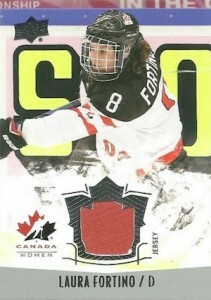 Dozens of current and recent NHL standouts have worn the red and white at the World Juniors where the team routinely comes home with a medal. 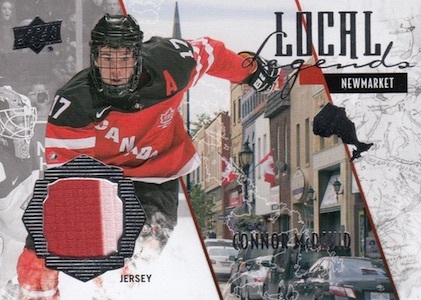 2015 Upper Deck Team Canada Juniors hockey cards focus on recent prospects who have suited up for the national team. Like its debut last year, the product has plenty of autographs and memorabilia cards. Hobby boxes have six hits. The first is an Autographed Patch card numbered to 199 or less. There are also two additional autographs or premium memorabilia cards. Among these, many boxes have a second Autographed Patch card. 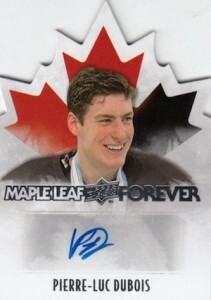 New this year are die-cut Maple Leaf Forever cards. These have autographed, sleeve patch and manufacturer logo patch versions. Other possibilities among this group are Base Black Autograph parallels, Dual Autographs, patch cards with Nameplates, Tags and Commemorative Patches, and Duo, Trio, Quad and Jumbo Jersey cards. 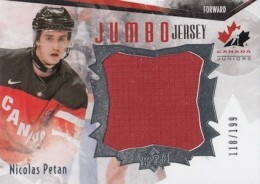 2015 Upper Deck Team Canada Juniors Hockey boxes also have three basic game-used jersey cards. These come in four varieties: Canada Men's Jerseys (1:20 packs), True North (1:24), Canada Women's Jerseys (1:30) and Local Legends (1:36). 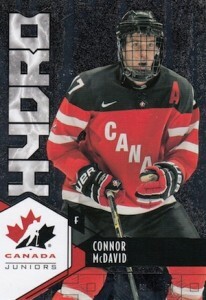 The set's checklist includes several of hockey's top prospects including Connor McDavid. Max Domi, Zach Fucale and Nick Ritchie are among the players in the product. 2015-16 UD TEAM CANADA JUNIORS TYLER SOY JERSEY PATCH AUTOGRAPH #138 175 199! 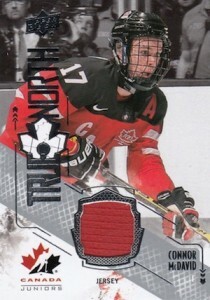 15-16 UD Team Canada World Juniors Dual Patch Fabbri Domi 9 9 Sick Patches! 76 cards. Serial numbered #/5. 16 cards. Serial numbered #/199. 51 cards. Group odds noted below. Set’s like this are the reason I still collect. I hope they can do a Team Canada themed product every year. I opened am entire case (12 boxes) and a lot of base cards are missing, such as #1 Callum Booth or #5 Nick Merkley, among many others. Even if they were highly SP, I should have still had 1 or 2. Did anyone else have the same problem or it’s just me? Likely just a weird case – I broke 2 loose boxes and have the full base set 1-100 plus multiple doubles. Pulled 1 SP Patch AU and 1 Nameplate (Roy 1/3) – love this product! 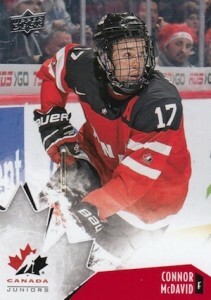 I love watching the World Junior Championship, and I love Canada. This set is way overpriced. You will not make money on it unless you pulled a McDavid auto. It is a set for the collector but not to make money. You are better off collecting what you want on ebay. The patch/auto /199 go for 5-10 dollars on ebay. I would like to hear someon�s opinion after purchasing a case. I pulled a one of one yellow printing plate. Are these worth anything? Just opened a box, only 100 cards total, but I got 2 auto patches, 5 other patch cards (incl. 1 quad, 1 McDavid Jumbo), Z. Fucale auto 3/5, and 16 other inserts. Way more value than I expected! On the day the cup 2015-16 was being bought up at my lcs like hungry hungry hippos, I bought this. Amazing value, top 3: true north gold patch max domi, trio jersey mcdavid/domi/fabbri, and a mcdavid high gloss 10/25. Amazing value on my first box break. These pulls are not worth hundreds of dollars but true collectors joy is when you pull a superstar in the making and hopefully watch him be the face of the NHL for years to come. Fun break. Got a card not on this list. Autograph variation of base card. Looks the same as base + sticker auto and authenticity verbiage on back.